The top show jumpers in the world, including Eric Lamaze, will compete at the Spruce Meadows Masters. 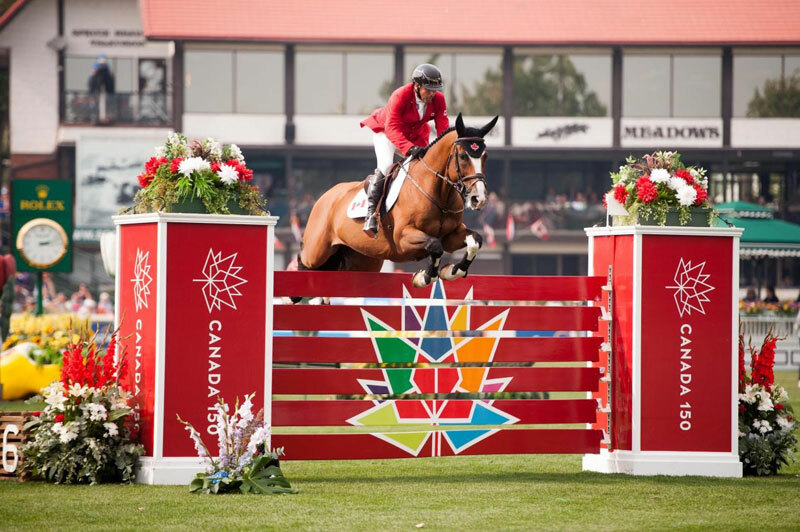 The CSIO Spruce Meadows ‘Masters’, one of the most revered and respected equestrian events in the world, will welcome the world’s best riders to Canada from September 5-9, 2018, as they compete for the most sought-after prize in equestrian sport, the Rolex Grand Slam of Show Jumping. Immense and enthusiastic crowds are expected to welcome the competitors to Calgary for the third Major of the year. The second Major, CHIO Aachen, saw Germany’s Marcus Ehning claim the Rolex Grand Prix, with Rolex Testimonee Steve Guerdat close on his heels. The climax of the Spruce Meadows ‘Masters’ will undoubtedly be the CP ‘International’, presented by Rolex, on Sunday September 9, where the top-performing horse and rider pairs will compete to become the live contender of the Rolex Grand Slam of Show Jumping. In 2017 Spruce Meadows welcomed 87,000 supporters for the Grand Prix event, all eager to watch this elite competition unfold in the famous International Ring. In 2018, acclaimed designer Leopoldo Palacios (VEN) will once again deliver an incredible three-round course that is both technically challenging and innovative, promising to test horse and rider alike. “If they hope to win this thrilling competition, each pair will need to perform at their best, showing courage throughout,” Palacios affirmed. “Only the best will vie for a coveted spot in the second round, and a jump-off is never guaranteed in this event.” With participation from some of the top riders, the CP ‘International’, presented by Rolex promises to be as thrilling as ever. The Rolex Grand Slam of Show Jumping rewards any rider who manages to complete the ultimate challenge of winning three equestrian Majors in succession, and it is now widely regarded as the most prestigious contest in equestrian sport. In 2018 a new Major was added to the Rolex Grand Slam of Show Jumping. The Dutch Masters, situated in ‘s-Hertogenbosch, joined CHIO Aachen, the CSIO Spruce Meadows ‘Masters’ and CHI Geneva to become the fourth Major, thereby giving riders an additional opportunity to secure the ultimate prize. Ehning will be up against tough competition, with a host of Rolex equestrian Testimonees contending for the Grand Prix in this year’s third Major. Joining Ehning will be world number ten Kent Farrington (USA), back after time away from the Majors due to injury and Steve Guerdat (SUI), who so nearly claimed victory in the Rolex Grand Prix at CHIO Aachen this year. Spruce Meadows was founded in 1975 by the Southern family with the aim of creating a unique event where world class equestrian sport could flourish. It is now regarded as one of the most versatile global events, with over 1,000 horses competing over four months across seven different sections of the grounds, with an annual attendance of over 500,000 spectators. Rolex has been at the forefront of equestrian sport for over 60 years, and the year 2019 will mark the 30th anniversary of its long-standing partnership with Spruce Meadows.